Why are we adopting? I mean, really... aren't we busy enough with our 4 boys? Couldn't we find other ways to use this money we are paying to agencies? John Piper explains the theological basis of adoption... we adopt horizontally (adopting children) because of our vertical adoption (adoption by God). 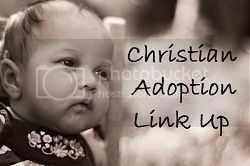 Not every believer is called to adopt, and this blog is certainly not intended to convey that. What we can do is to consider how we can be involved in the spiritual and horizontal adoption of others! Love this. This is our heart as we adopt. Just had to share. What a year this has been! Our last post one year ago found us waiting on the Lord’s leading for our family to a new place of ministry. By November, God had opened doors and our family stepped through them. We are thankful for God’s gracious direction. And now two years after first talking about the possibility of adopting, we are ready to officially begin the journey! It can be an overwhelming thought, but our God is big, and we know that His heart is for the fatherless and for His glory to be spread throughout the earth. Why adopt? Why our family? Why now? Don’t we already have 4 children? Simply put, we want to adopt because of God’s love for and adoption of us. We want to adopt because of the gospel. All of life for the believer – for married couples, singles, childless couples, and families with children-- must be motivated by the gospel, about the gospel, lived for the gospel and Christ’s glory being spread throughout all the world. God has placed adoption in our hearts and we want to follow Him. While your family may not be called to adopt, you are called to live out the gospel. How does that look for you and your family? We are excited to finally begin this journey. We want to bring a little girl into our home, show her the love of a family, and point her to God the Father who alone can give her abundant life through Christ. We are happy to be Making Room 4 One More. We will be adopting a little girl between the ages of 0-4 from Russia. We discovered an agency that specializes in Russian adoptions only a skip and a jump from where we live now. They were the second American agency to receive accreditation from Russia. This adoption will now require 3 trips to Russia as of 2012. The first step will be to complete our home study. We will also be updating our Just Love Coffee Storefront to begin raising some funds for our adoption expenses and travel expenses. Pray for our family. Pray for the little girl God has for us. Pray for her heart and emotions to be calmed during this process. Pray for her safety and health. Pray that she would know God’s love for her and come to saving faith. Pray for opportunities to share the Gospel because of our adoption. It is a clear picture of what God did for every believer! There are more ways you can help, and we will tell you about them soon. This is the obvious question asked of our family. I mean, we really do have a busy life with our four busy, loud, energetic boys. And they are all boy - digging tunnels to China in the backyard, bouncing off the walls if they're in the house too long, and the whole frogs and snails and puppy dog tails thing. Why adopt? The answer for us is that God put that desire in our hearts. For our family, the question became “Why not adopt?” It won’t be something God burdens everyone about. But for us, the reasons we could give to the question “Why not adopt” just didn’t seem to hold weight in comparison to the opportunity to change the life of a child. In looking at international adoption, we realize that we will be adopting a child that may not have an opportunity to hear the Gospel otherwise. And we pray that our story will point people to the story of Redemption and God’s adoption of us when we were in desperate need because of our sin. To love an orphan is our joyful response to the loving Father who sought us when we were orphans.